Piedmont Lithium Limited ("Piedmont" or "Company") (ASX:PLL; NASDAQ: PLLL) is pleased to advise that the Company has received assay results from a further 41 holes from the current drilling campaign on its properties in the Carolina Tin-Spodumene Belt ("TSB") in North Carolina, United States. The Company remains on schedule to release a maiden Mineral Resource estimate in accordance with the JORC Code by the end of the 2nd Quarter 2018. 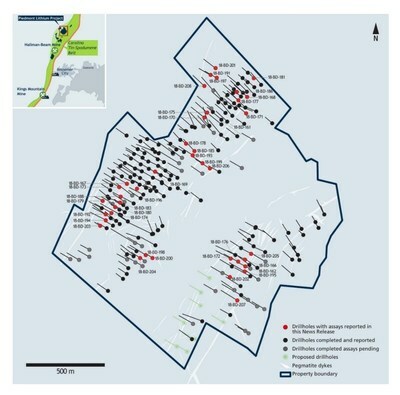 The results build upon the previous drilling completed on the property and continue to show similar high-grade mineralisation and pegmatite intercepts. For the Phase 3 program, the Company has completed 117 holes totalling 20,279 meters. Due to operational efficiencies of the Piedmont field crew and the drilling contractor, the original Phase 3 program was completed under budget, thus allowing for additional drill meters at the Piedmont Project as well as initial drilling at the regional targets, Sunnyside and the Central Properties. The table below shows an updated Plan for Phase 3 drilling. Infill drilling at the Core property is completed and exploratory drilling will be completed in the coming weeks. The maiden Mineral Resource estimate continues to remain on-track for delivery by end of 2nd Quarter 2018. A drill rig will be mobilized to the Sunnyside property within the next few weeks as soon as the North Carolina State Sedimentation and Erosion permit is issued. The initial Sunnyside drilling is expected to consist of 4 to 6 holes totalling 600 to 900 meters. Keith D. Phillips, President and Chief Executive Officer, said, "Phase 3 drilling has been very successful. Strong results have been generated and the team has accomplished the project on-time and under-budget. We are on track to have a maiden Mineral Resource estimate in June and a Scoping Study shortly thereafter." The seven exploratory holes tested three areas. The first was an area in the north western portion of the property defined by holes 18-BD-191, 197, 201, and 208. This area consisted of subcrop and boulder trains that had not been previously drill tested. All four holes returned multiple mineralized pegmatites. A few of the significant intercepts are in18-BD-208 where 8.0m @ 1.62% Li2O was reported and in 18-BD-197 where 3.0m @ 1.34% Li2O and 5.5m @ 1.38% Li2O was reported. In the second area, located in the north central portion of the property, holes 18-BD-199 and 206 tested outcrop and boulders not previously drill tested. Both holes returned multiple zone of mineralized pegmatite (results in Appendix 1). The third area was a follow up to the historic hole 10-BD-14 in which 18-BD-207 was collared approximately 40 meters to the southwest. 18-BD-207 intercepted 6 mineralized pegmatites with high grade intercepts of 3.8m @ 1.20% Li2O and 2.1m @ 1.99% Li2O.